So what does LG mean by their next 'major' phone? Well, they reference the G and Q line ups, so that really only leaves the V series. Now the V series is known for having that special secondary display, and it's about time to refresh the V20, so it would make sense they're hinting at the LG V30. Okay, so what about it. First up we hear that it's going to use OLED. LG has primarily been using IPS LCD displays, which is fine, but it means that they technically can't take advantage of Google's DayDream (I'm sure there's a technical reason why ... just it's above me). Second, we hear it's going to have their FullVision display, which they set up first with the G6 to have that 2:1 display ratio (2880x1440). Now this is interesting as they don't list any secondary display resolution. So, will the V lose the second display? Or will it be folded up around the camera/speaker like the "Essential"? With FullVision it'll also have Dolby HD or HDR10 display capabilities (so far, it's still only available with Netflix as far as I can tell). So, aside from spending some good coin on great cameras (since the G4) they've now really started to put their efforts into amazing displays. Not that they weren't great before. TORONTO, Aug. 3, 2017 — The next flagship smartphone from LG Electronics (LG) will be the first ever device to feature a plastic OLED FullVision display, consistent with the company’s smartphone display that started with the LG G6 and continues with the LG Q6. As LG’s first OLED smartphone since the LG G Flex 2 in 2015, the shift marks a move by LG to extend its OLED leadership from the premium TV sector into the premium smartphone space. Beyond their slim profile and excellent visuals, OLED displays in smartphones are ideal for VR applications, one of the key growth areas in the smartphone industry. While the immersive LCD FullVision display was first introduced in the LG G6 earlier this year, the display in the company’s upcoming flagship device will be its first OLED smartphone since the LG Flex 2 in 2015. The shift marks a move by LG to extend its OLED leadership from the premium TV sector into the premium smartphone space. Beyond their slim profile and excellent visuals, OLED displays in smartphones are ideal for VR applications, one of the key growth areas in the smartphone industry. With consumers seeking bigger displays but eschewing larger phones that are uncomfortable to hold in one hand, LG’s FullVision display is a key contributor in the trend toward minimized bezels in smartphones. OLED was simply the next evolution for FullVision displays, delivering incredible quality, vividness and clarity to smartphone visuals. At six inches, the OLED FullVision display will be LG’s largest in four years while the actual body will be smaller than last year’s LG V20. As the upper and lower bezels have been reduced by 20 and 50 percent when compared to the V20, the LG logo has been moved from the bottom of the display to the back of the phone to maximize viewable screen space. The FullVision display’s immersive and expansive visual experience is enhanced on the 4.15 million pixels of the QHD+ (1440 x 2880) OLED screen. Superb image quality is achieved via emissive OLED technology which reproduces perfect black and colours with greater accuracy and across a wider colour spectrum. By implementing optimal image algorithms gleaned from years of OLED research and development, visuals on this OLED display deliver 148 percent of the sRGB1 colour space for digital images and 109 percent of the DCI-P32 colour space for digital cinema. Another intrinsic advantage of OLED technology is operational response time which is tens of times faster than LCD. This accelerated response time effectively eliminates afterimages, an important consideration for action movies and VR. And with support for HDR10, watching compatible movies and videos on this display offers a whole new eye-opening experience. And because the screen in the upcoming smartphone will be based on plastic OLED – otherwise known as P-OLED – technology, the edges can be curved to allow for a more ergonomic design and a better feel in the hand. P-OLED is created by placing pixels on a plastic substrate which is much stronger than a glass base. What’s more, the display is protected by Corning® Gorilla® Glass 5 that incorporates shatter-resistant technology. 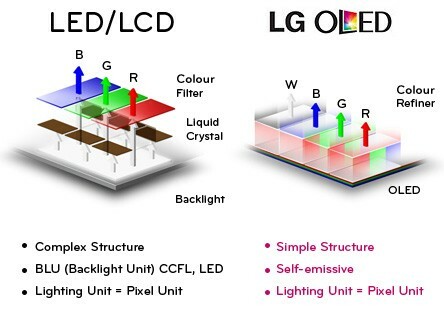 Most importantly, using advanced encapsulation and pixel-scanning technology, the burn-in problem that has affected OLED technology in the past has been all but eliminated in the P-OLED technology in LG’s upcoming device. Encapsulation significantly reduces oxidation of the pixels and LG’s pixel-scanning technology allows for less energy to be applied to each pixel, also saving battery power. 1 sRGB is the colour space created by HP and Microsoft for use as a reference standard on monitors, printers and the internet since 1996. 2 DCI-P3 is a colour space proposed by the Digital Cinema Initiative (DCI), a group led by major Hollywood movie studios, mainly used as a standard for measuring the richness and accuracy of colour expressed in movies.